Miniature Air Flow Transmitter serves HVAC applications. With compact design suitedÂ forÂ mass applications in HVAC, EE671 measures air velocity up to 20 m/sec. Built-in VTQ flow sensing element, which is resistant to pollutants, works on hot-film anemometer principle. Available with cable or plug connection, transmitter provides air velocity measurements as linear voltage output options of 0–1 V, 0–5 V, or 0–10 V. Alignment strip on probe and matching mounting flange facilitates installation and ensures proper alignment of sensor. The new transmitter EE671 measures air velocity up to 20 m/s. Thanks to its compact design it is ideal for mass applications in HVAC. The flow sensing element sets new standards in terms of accuracy and resistance to pollutants. The built-in VTQ flow sensing element based on thin-film technology works on the hot-film anemometer principle. Thanks to its innovative design - made possible by the use of the latest transfer molding technology - the sensor is particularly resistant to contamination. A high reproducibility of the sensor characteristics, fast response time, low angle dependence and excellent long-term stability are further advantages of the high-quality sensing element. The EE671 is available with cable or plug connection. 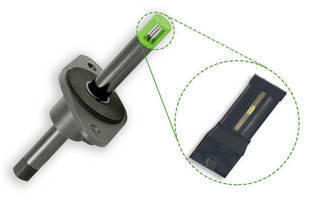 An alignment strip on the probe and matching mounting flange simplifies installation and ensures proper alignment of the sensor. The flange enables the immersion depth to be infinetly variable. The measured air velocity is available as linear voltage output (optional 0-1V, 0-5V or 0-10V). The digital interface in combination with a configuration kit allows the customer to set the measurement range, to configure the output signal and to adjust the transmitter. The EE671 is suitable for use in heating and ventilation systems, for flow monitoring and control or for inlet air monitoring in ovens. Ultrasonic Level and Flow Sensor offers early flood warning. Magnetic Switch Sensors feature TMR technology. Air Data Boom includes total air temperature sensor. Contactless Fluid Sensor works with tubes up to 0.25 in. OD. Electro-Pneumatic Transducer is approved for natural gas.